France says it may carry out airstrikes against Islamic State targets in Syria as an act of self-defense. Last week French aircraft started to undertake reconnaissance missions over Syria. On Monday, French President Francois Hollande said French military sorties in Syria would soon expand to include airstrikes against Islamic State (IS, formerly ISIS/ISIL). French Foreign Minister Laurent Fabius said the use of weapons on Syrian territory is justified due to a string of Islamist attacks in Europe. “We received specific intelligence indicating that the resent terrorist attacks against France and other European nations were organized by Daesh [Arabic derogatory term for IS] in Syria. Due to this threat we decided to start reconnaissance flights to have the option for airstrikes, if that would be necessary. This is self-defense,” the minister told the Belgian media. Paris previously announced its readiness to bomb targets in Syria in 2013, when the United States threatened military intervention against the government of President Bashar Assad. Damascus never formally requested the US-led coalition, which was formed in response to IS taking over large parts of Iraq last year, to expand its airstrikes into Syria. This technically makes such attacks illegal under international law. However, the Syrian government is so far turning a blind eye to the violations of its sovereignty. Damascus is facing a war with IS as well as with other terrorist groups like Al-Nusra Front and US-backed rebel forces, who Washington consider to be moderates. The US and its allies insist that President Assad should be ousted and has no place in the future of Syria. France now says his departure must not be a condition for political dialogue to start. 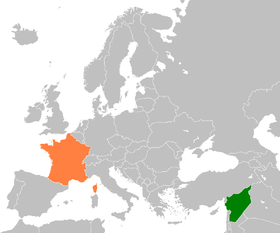 “If we require, even before negotiations start, that Assad step down, we won’t get far,” Fabius told Le Figaro. Russia, which is supporting Syria in its fight against IS jihadists and is providing Damascus with military supplies, has repeatedly called on a broader coalition to fight the terrorist organization. Europe has endured several attacks by Islamist militants since the turn of the year, including the massacre at the Charlie Hebdo satirical magazine in Paris and a failed to attempt to kill passengers aboard a high speed Thalys train travelling near the French-Belgian border.